The following Saturday after I returned from London, I decided to take a short train ride to Linz, Austria. I boarded the train with the intention of visiting Mauthausen Concentration Camp, which is about an hour bus ride outside of Linz. My grandfather, Jesse Entenberg, liberated the camp in 1945. 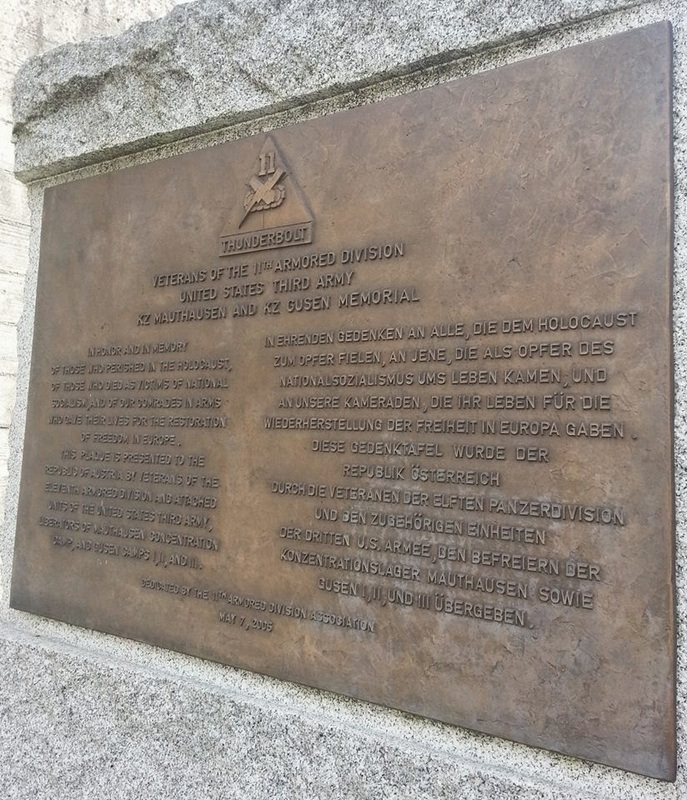 Once I arrived at the train station, I waited for the next bus to Mauthausen. It was already near 2pm, and I was anxious that I would arrive after the last admittance time. I boarded the bus anyway. The bus ride was accompanied by the most beautiful scenery I had seen in a while. Spring had sprung in Austria, so the hills were covered with the greenest grass and white and yellow wildflowers were sprinkled everywhere. There was not a cloud in the blue sky, and it was truly a gorgeous day. I kept eyeing my watch seeing time pass quickly. About 40 minutes into the bus ride, I knew I wouldn't make it in time to fully experience the camp, so I got off the bus. Yes, I got off of the bus in the middle of no where. 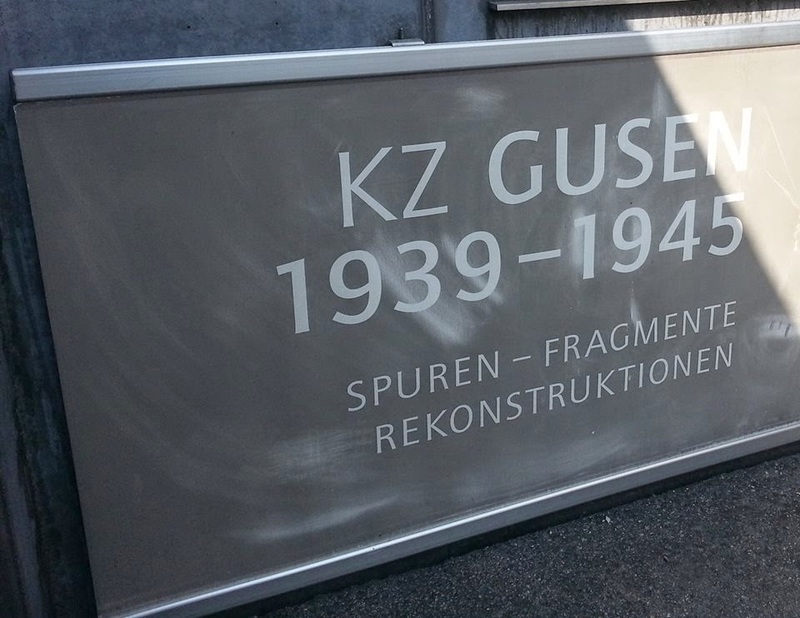 As the bus drove away to it's final destination, it revealed a sign on the other side of the road: KZ GUSEN 1939-1945. I knew KZ stood for concentration camp. 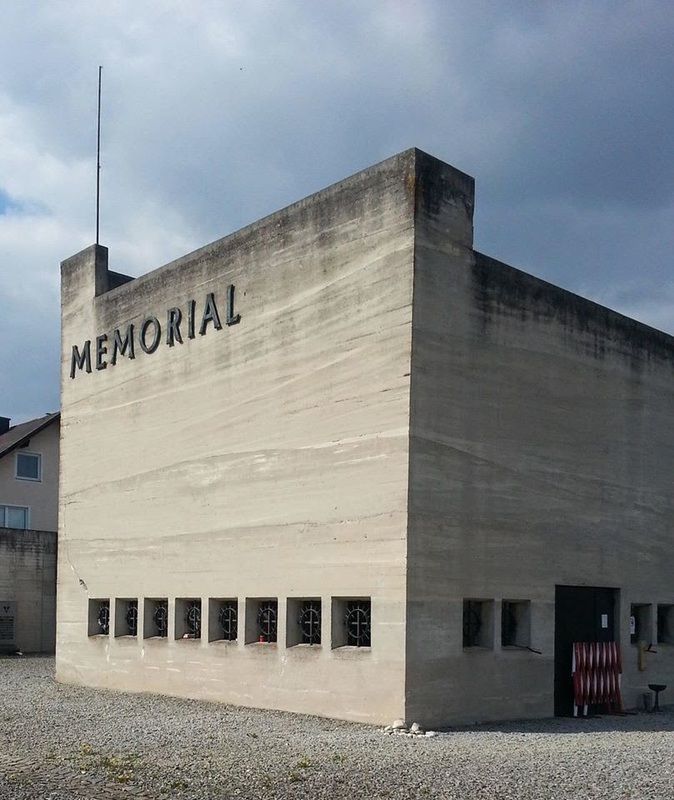 Then, my eyes were drawn to big block letters on a concrete building that read: MEMORIAL. I was spooked. There I stood next to a road in the middle of the Austrian countryside. It was a picture perfect day, and all I could hear were the birds above, car wheels against the gravel, and a couple of kids playing in the distance. Two other people disembarked the bus with me, but they walked the other direction. I was completely alone. A concentration camp was staring me in the face. I needed to go check it out. I crossed the road and walked down the concrete path to the visitors' center. The door was unlocked, everything was running, but not a soul was there. Not even a receptionist at the front desk. Again, I was alone. I went through the exhibit, watched the videos, and read the material. 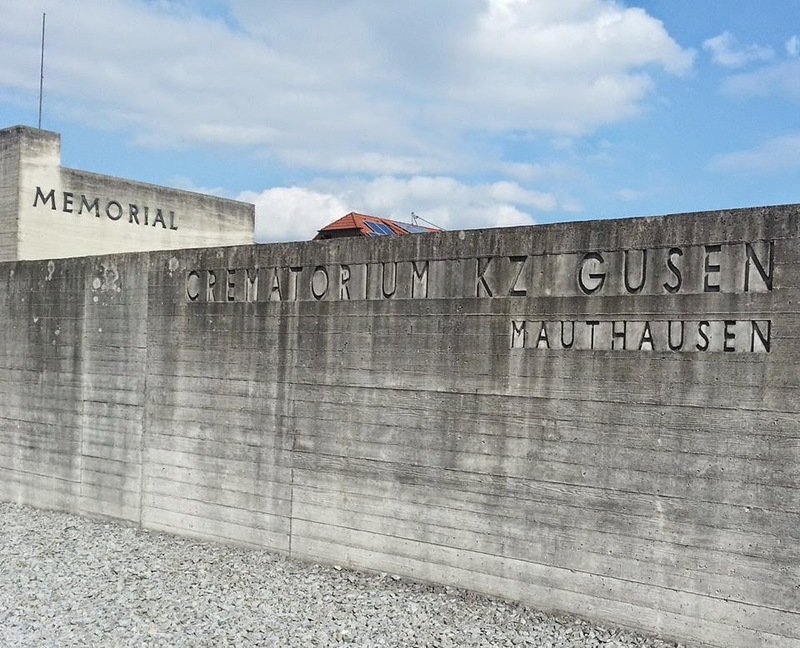 I was at the Gusen Concentration Camp in Gusen, Austria about 10-11km from Mauthausen. KZ Gusen was made up of stone-quarries and consisted of three camps. The history of Gusen was intense and terrifying. I recall being incredibly overwhelmed by the stories presented. And, since I was alone, I remember sobbing. No one was there to judge, so I cried. I left the building in a hurry after I finished going over the material. As I went through the glass doors and down the concrete path, I stopped at the corner of a building next to the path. I knew something was there that I needed to see, but I wasn't sure what it was. I was afraid to step off of the sidewalk. I was sure some alarms were going to go off or something. But I did it anyway. The only thing I could hear were my footsteps on the stones. I walked through the narrow pathway, and when I got to an open yard full of gravel, I turned my head. The crematorium stood to my right. Sure, I was startled. There were cutouts in the building, so I peeked inside. There were memorials and plaques lining the walls, and I'm pretty sure the oven machinery was there too. The doors to the crematorium were taped off. Thank goodness, because if they were open, I probably would have gone inside and scared myself half to death. I stood in the yard for a while. I tried to soak in everything surrounding me. I thought of the thousands of prisoners that once stood where I had planted my feet. The pain they had suffered and the horrors they had witnessed. I knew I had gotten off of the bus for a reason, and that reason was to experience this intense moment. After becoming sufficiently depressed, I made my way to the bus stop. On my way out, I encountered a plaque commemorating the 11th Armored Division of the US Third Army - the division my grandfather was a part of. That was special. From there, I waited at the bus stop, boarded the bus and took it to the train station, got on the train, and went home to Vienna. I recall having trouble sleeping that night. Too many thoughts were running through my mind. 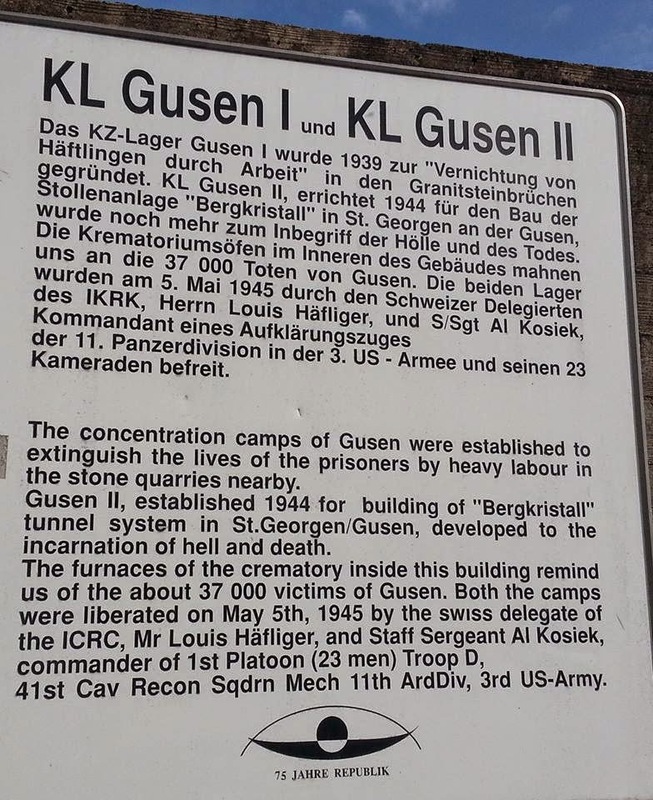 While my trip to Gusen was unsettling and scary, it is something I will never forget. It provided a unique link to my ancestry that will remain with me always. I am a 21-year-old who studied abroad in Vienna, Austria in Spring 2014. I am now a fourth-year stage management student at The Conservatory of Theatre Arts at Webster University in St. Louis, Missouri. I want to share stories, photos, and emotions about my travels around Europe - as I successfully visited 30 cities in 10 countries and still attended classes in Vienna during the week.